Pools are sat 15th in the National League table at present, and with five games remaining. Slight threats of relegation have been dispelled and their play-off charge ended a long time ago. Hignett’s side were defeated 3-2 away at Eastleigh at the weekend, and with the season coming to an end, the manager admits he has a challenge to keep his players motivated for the final fixtures. “It’s just about keeping them interested and keeping them involved,” said the Pools boss. "It’s a challenge I have to deal with and it’s knowing how to get the best out of your players and what they respond to. "The contract situation is something that will help me. "In the next couple of weeks we’ll start talking to the players but I want the season to be done and dusted and I want us to be going the right way before any of that is sorted. “I think with our new system and how we’re playing they’re all enjoying it, and ultimately I think we are all enjoying the attacking element of it. As long as they enjoy what you’re doing they’ll be it in for you, and I’m the type of manager, I think, that players want to play for. 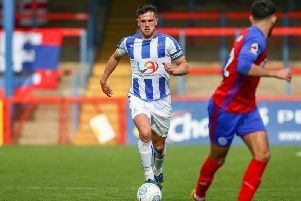 Pools are back in action at the Super 6 Stadium on Saturday against Solihull Moors, and Hignett is hoping for an entertaining encounter. “We’ve got a young side with some good, young players. We’re playing exciting football and being involved in exciting games," he said.